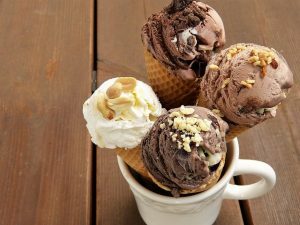 Here are three fun ways you can cool off with ice cream that is topped with local sweet treats! In the heat and humidity of a typical Maryland summer, ice cream is the ultimate frozen dessert. This is precisely the reason why July is National Ice Cream Month. Ice cream is delicious all year long, but even more so when you’re craving something that can cool you down. For the ultimate ice cream experience, however, you’ll need all kinds of toppings. Gourmet, locally-made sweets are the ideal toppings for your ice cream desserts this summer. Here are three fun ways you can cool off with ice cream that is topped with local sweet treats! Who doesn’t love the rich taste of fudge in their ice cream? No matter what flavor of ice cream or fudge you prefer, there is a combination that will keep you satisfied even after National Ice Cream Month ends. Want to try a burst of flavor with your vanilla ice cream? Try blending in some peanut butter explosion fudge. Are you a chocolate lover? Create an even richer dessert by adding thick, creamy chocolate fudge to your chocolate ice cream for an even more decadent take on a summer classic. Summertime calls for summer-themed candies, and what’s more summer than chocolate-filled seashells? By adding these beautiful and brightly-colored candies to your ice cream, you’ll be celebrating National Ice Cream Month in style. They’ll also liven up your ice cream with a slight crunch! If you enjoy fruit-flavored ice cream or sherbet, topping your ice cream with fruity shortbread bites will create even more of a heavenly flavor. Why not mix up your strawberry ice cream sundae by adding some lemon blueberry shortbread bites? If you’re a lemon sherbet fan, try topping your dessert with strawberry shortbread bites for an even more fruity flavor! This entry was posted on Friday, July 6th, 2018 at 9:25 am. You can skip to the end and leave a response. Pinging is currently not allowed.